Kurchenko thus sponsored the leader of the New Forces' Movement. Photo: Max Trebukhov Prosecutor-General Yuriy Lutsenko says that the investigation has evidence about the transfer of 500 thousand dollars from fugitive Ukrainian oligarch Serhiy Kurchenko to the people close to Mykhailo Saakashvili. 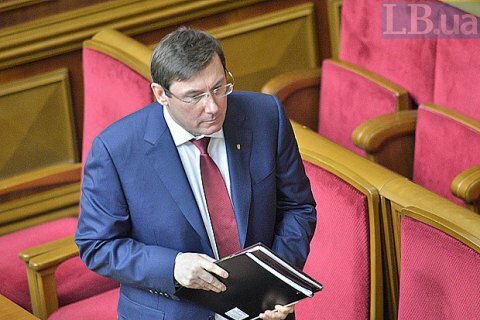 Lutsenko said Kurchenko thus sponsored the leader of the New Forces' Movement in exchange for the return of assets that he lost after fleeing to Moscow. "A person close to Saakashvili, namely Severion Dangadze [coordinator of the PHC in the Kyiv region] on behalf of Saakashvili approached Kurchenko, who is hiding in Moscow, with a proposal to finance Saakashvili's political campaign in exchange for protecting the interests of the members of an organized criminal group," Lutsenko told a briefing on Tuesday, 5 December. "We have recorded the receipt of about 0.5mn dollars from the Russian party. Security services [later] seized about half of the sum from of Dangadze," said the chief prosecutor. On Tuesday morning Saakashvili from the rooftop of a residential building in Kyiv center called for the help of his supporters and threatened to jump. He later was detained by special police force.